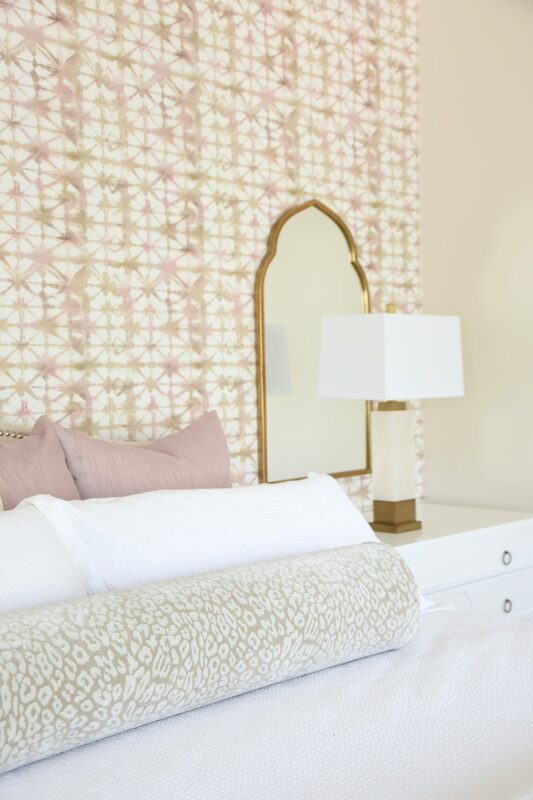 We are thisclose to finishing up our master bedroom refresh!! 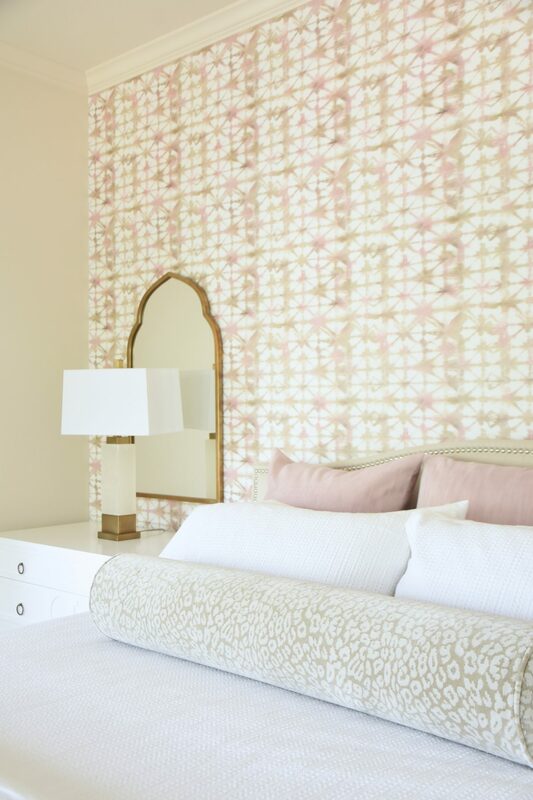 If you’ve been following along, you’ve seen our bedroom go from grey neutral to neutral with a pop of pink and pattern! 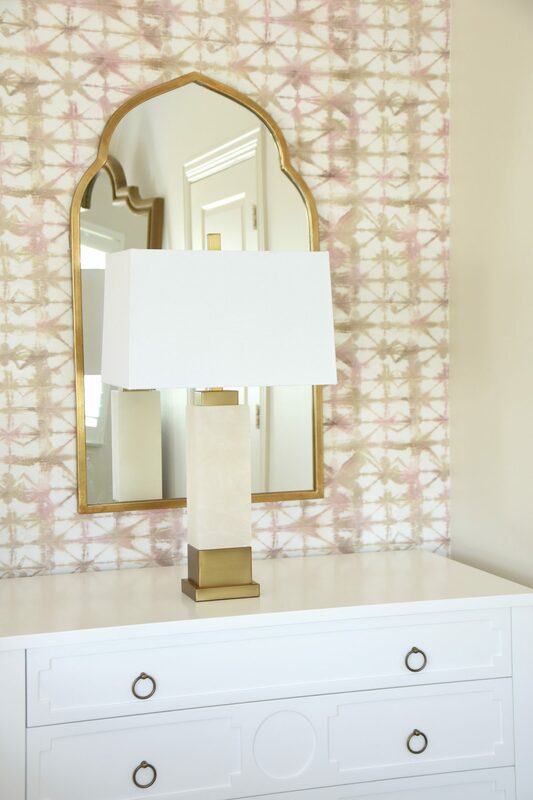 The addition of wallpaper to that back wall made all the difference, and since then we’ve been adding in coordinating pieces. In my last update, I showed you the dressers, mirrors, lamps and bedding, but most recently -accent pillows arrived and I absolutely love how they tie everything together! I’ve always struggled with making my bed looked finished and now I think it’s really coming together! I have three huge pink velvet euro pillows at the headboard, two king pillows that match the duvet, then a large leopard bolster. The missing piece of the puzzle is the bed with taller headboard, but I have ordered it and I’m just waiting for it to arrive! It’s back ordered until July! I’ve also made some progress on decorating the shelves in the sitting room and so far so good! I brought in all of the pink and white books I had around the house and ordered more on Amazon because you can usually find them for less than at the bookstore. Half price books is also another great resource for an expensive books. 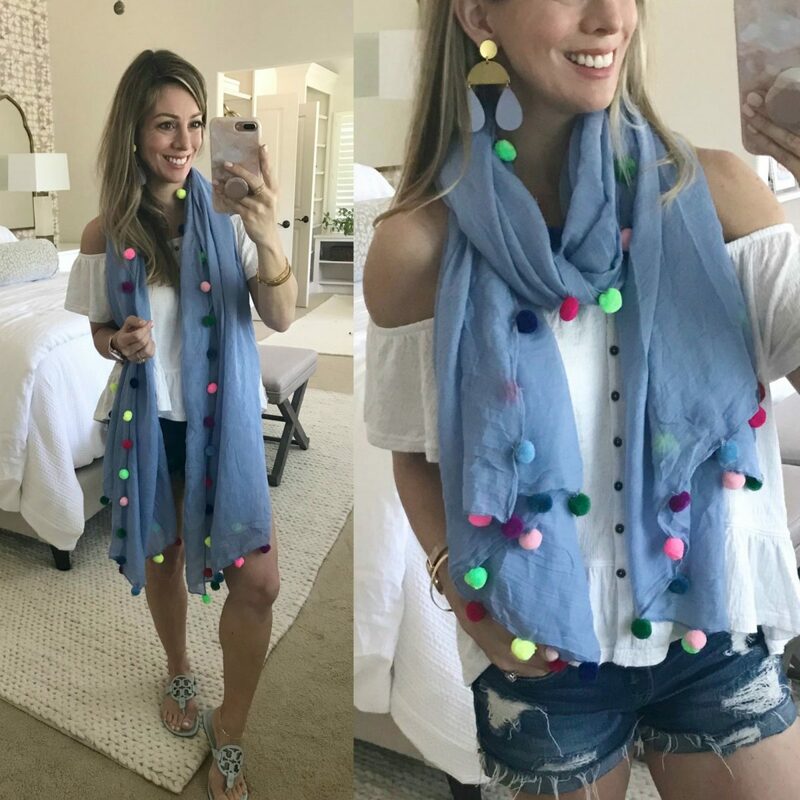 The Cutest Pom Pom Scarves for Only $8! 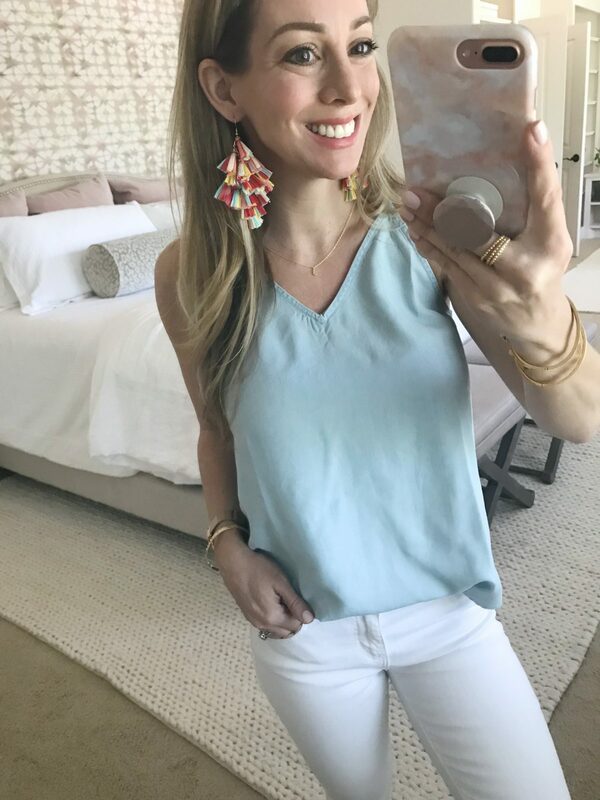 If you caught yesterday’s 35 Spring Outfit Ideas post, you saw that I stopped by Accessory Concierge when I was in Dallas and stocked up on some amazing jewelry (more on that below)! I was telling the owners that I couldn’t wait to come back home and share the scarves with y’all and asked if I could provide y’all with a discount code. They are normally $30, but you can get them for $8. $8!! #oneofeachplease!! 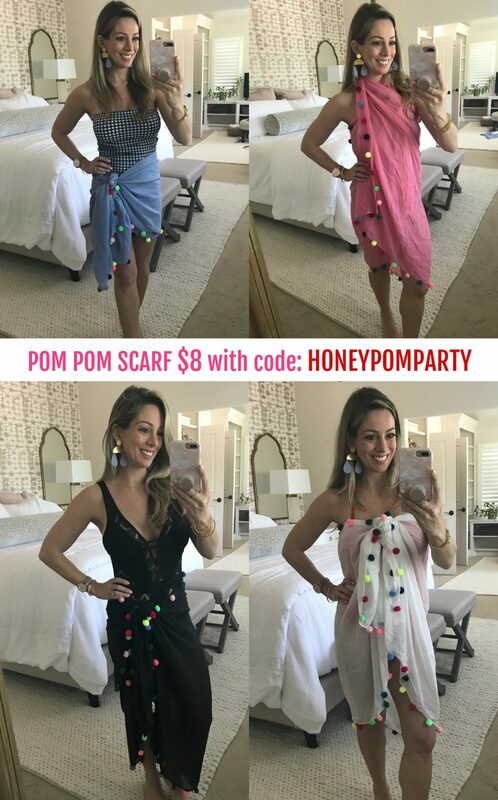 Use my code: HONEYPOMPARTY at checkout to get the Pom scarves for only $8! I’m thinking they’ll make great Mother’s Day gifts, teacher gifts, or even a perfect Favorite Thing for this year’s party! I know Jordan is sure smitten with them! Of course you can style them like a traditional scarf, and I love the pop of color it adds to your outfit. They are kind of like a gauzy material, so just right for the season. To get double duty out of them, you can throw them in your beach or pool bag and wear them as a swimsuit cover-up! How cool is that?! A swimsuit cover-up for only $8?!?! This is exactly why I needed so many! They are darling with your swimsuits and you can tie them in several different ways to achieve different looks. I saw that BLOOMINGDALES is having a sale with $25 off every $100 spent with code PRIVATE and Free Shipping over $150! My picks: My favorite swimsuit + the best Tory Burch flip flops together get you $75 off! And Accessory Concierge also has darling pom pom clutch and hats!! Never in all my life have I had a necklace named after me! Especially one as cute as this pink stone and tassel necklace!! Thank you to Accessory Concierge. It’s truly an honor and just super fun! And remember, if you buy the ‘Megan’ necklace and send me a picture of you wearing it, I’ll share it on Stories and my blog and tag you! I’m all about spreading the love! 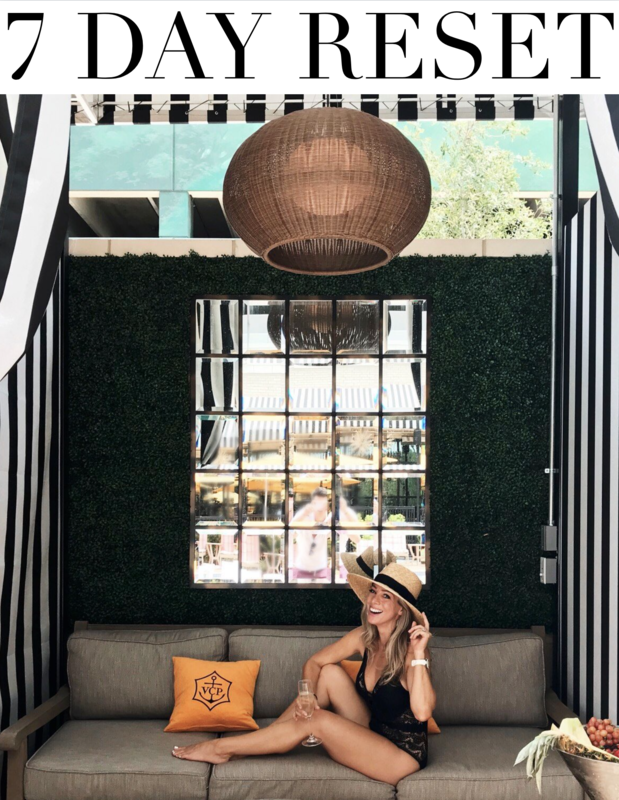 If you’re new to Accessory Concierge, I wanted to show you a couple more pieces that I’m smitten with to give you a taste of their style. They have lots of unique and bold, colorful pieces that really jazzed up your outfit! The earrings and necklaces I’m wearing below I picked up this weekend. A few more good finds lately are this jumpsuit and my Everyday Wedges. First up, the jumpsuit! This one checks all the boxes: Comfy ✔️ Easy to wear ✔️ With pockets ✔️ and 30% off today! 🎊 Woo Hoo!! It fits TTS, I’m wearing XSP. 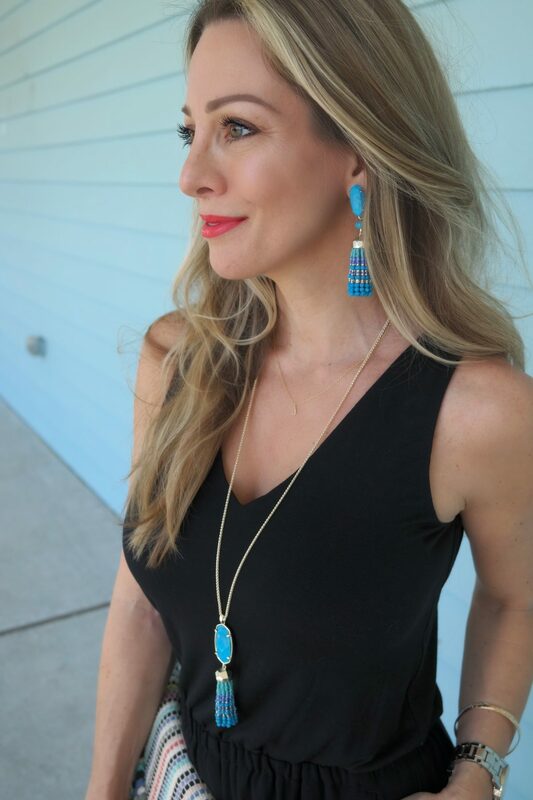 And below is a closer look at the jewelry, which is from Kendra Scott’s new summer collection! Take a peek- there’s lots of pretty colors and tassels in this collection! I’m sure you’ve seen me in these wedges already, but I’ve recently nicknamed them the ‘Everyday Wedge’ because they’re pretty much what I’m reaching for every day! They go with so many things in your closet and now I can’t wait for the black pair to arrive! I found the fit true to size but a few people said they had to size up half. 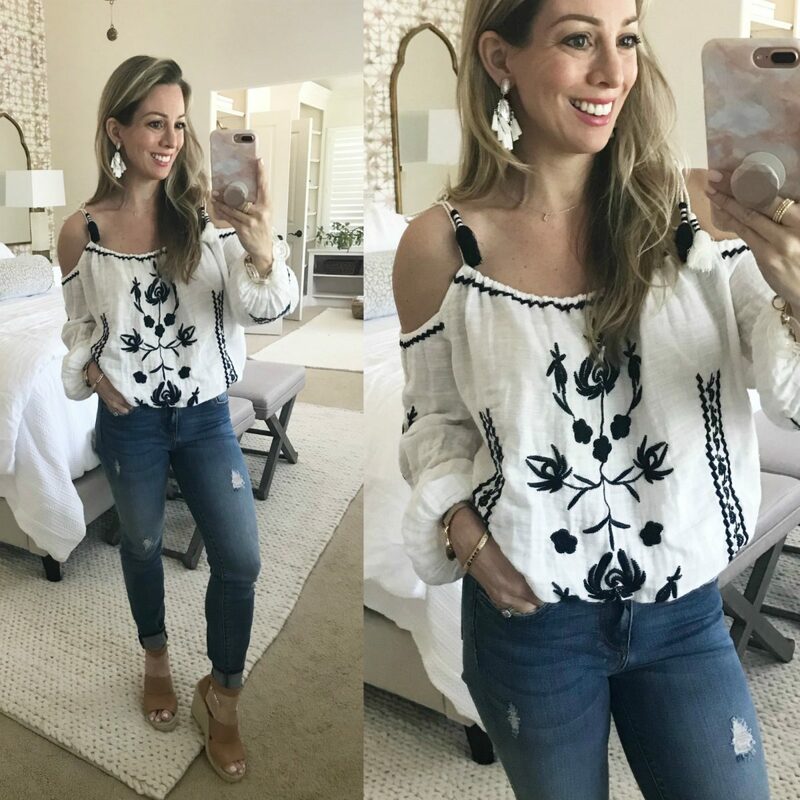 This embroidered cold shoulder top with tassels will be perfect for Cinco de Mayo! My jeans sold out in a hot minute, so I’m looking for them to be restocked, but these are similar with a more boyfriend cut. And below I created a collage to show you all of the things I’ve been wearing the Everyday Wedges with lately! 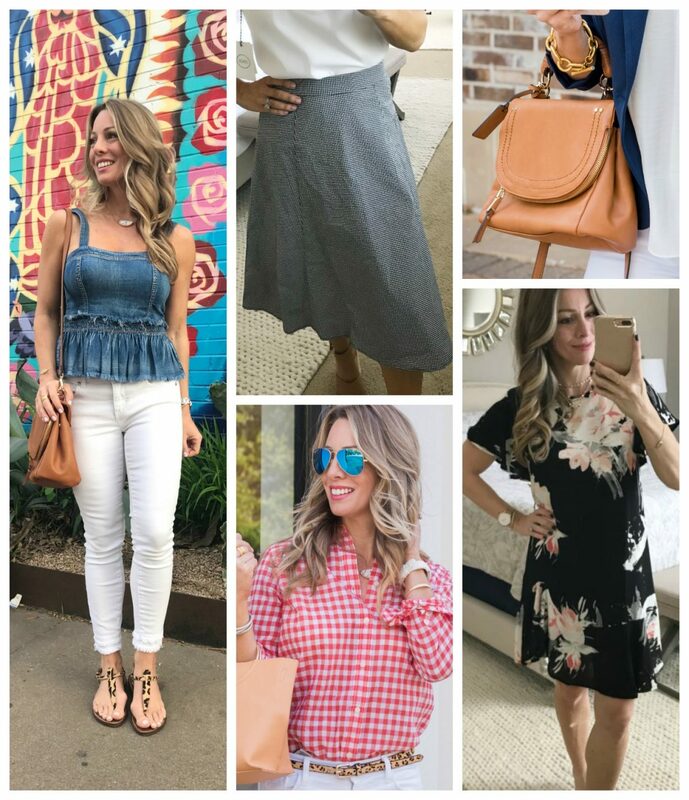 I did a huge round up of 35 Spring outfit ideas yesterday, but these outfits are recent so they didn’t make it! 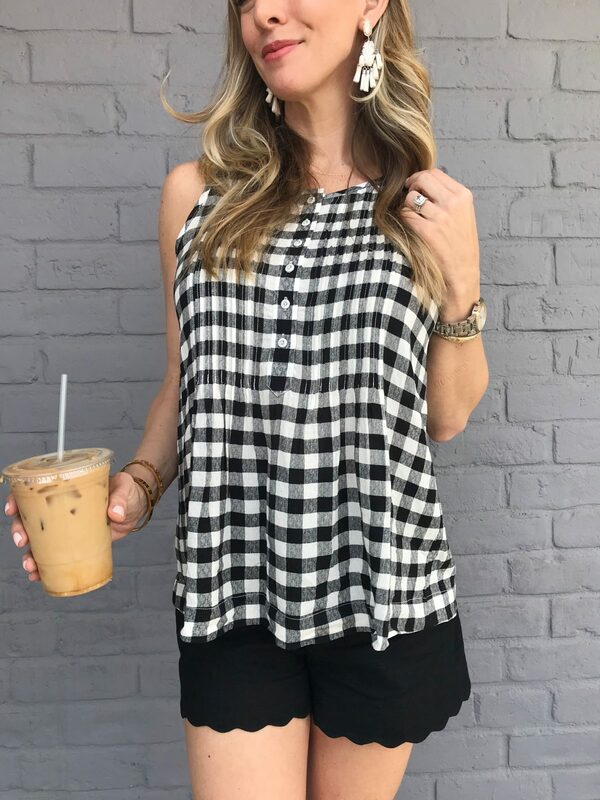 I’m all about the gingham and scallops right now and this tank is easy breezy goodness. The scallop shorts are a great cotton blend and have a nice weight to them. I also got them in white. They fit true to size, I’m wearing size 00. 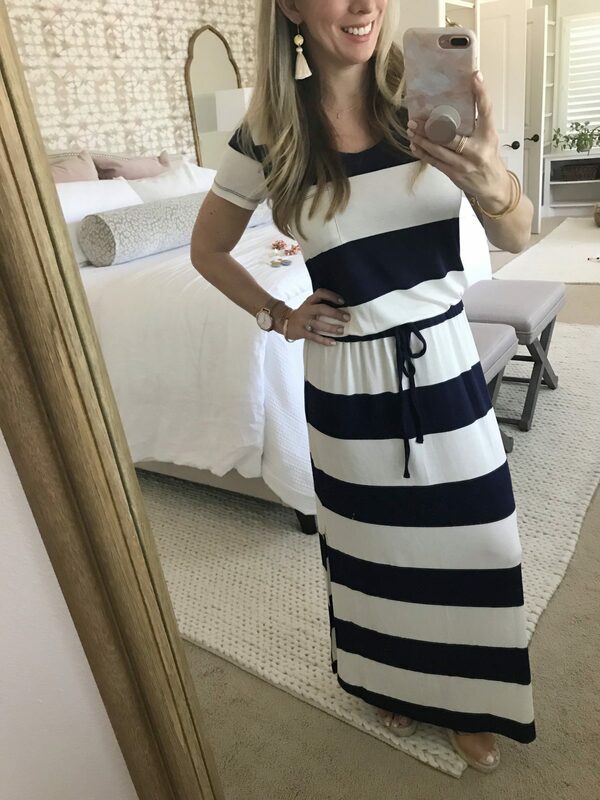 I wore this maxi dress yesterday and as soon as I put it on, I felt like I was wearing my favorite soft t-shirt, but in a dress! This one comes in regular and petite (wearing XXSP), so no alterations needed! Had to have the Nordy Girl sweatshirt. It’s actually pretty lightweight and I’m crazy for the pink and green combo! And my fuzzy pink slippers! James keeps trying to steal them from me! It’s so funny to see him wearing them! I’ve been wondering when I’m going to get back to my regular workout routine. I haven’t worked out since before the conference but I’ve been sick, so rest and recuperation come first. I took Jordan to the park the other day and got some exercise chasing her around, but I never really feel like myself unless I’m getting a few good workouts in a week! Hopefully next week I’m back at it! These shorts are great for running- they are fully lined with a comfortable stretchy waistband and the perfect length! 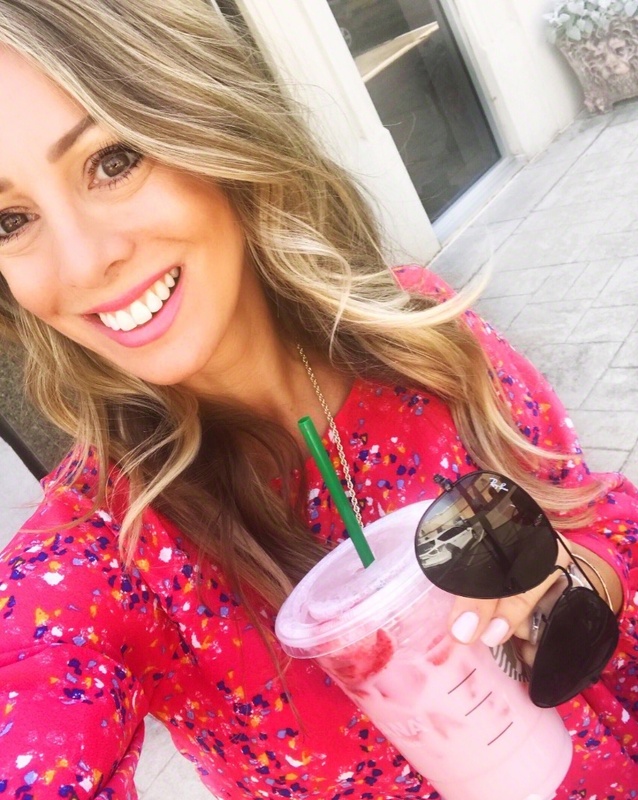 I found a few super cute things on sale to share with you! How darling is this shirt dress with zebras on it?! If your office allows sleeveless dress, this would be a good work option with heels. For weekend, throw on your sandals or Everyday Wedges! This stripe boat neck top is back in stock and on sale! AND the white jeans I’m wearing all the time with the double hem fringe are 30% off! My picks: This cotton tee has cute sleeve detail and this silky cami has scallops and polkadots! LOFT • 30% off full-price styles and extra 40% off sales! My picks: I love the pattern of this racerback tank! This short sleeve cardi would be a hit at the office! ANTHROPOLOGIE • Extra 25% Off Sale Items + 20% Off Full-Price Denim, Bedding, and Select Swim. My picks: This sassy pommed romper comes in red and black! This t-shirt dress has a drawstring waist – which is a must! BLOOMINGDALES • $25 off every $100 spent with code PRIVATE and Free Shipping over $150! My picks: This restorative hand cream leaves skin velvety-smooth and the discovery set is a great for starting out or for traveling! My picks: OMG this gingham ruffle wrap cami dress!! This tie waist rolled sleeve blouse would be a great work shirt! My picks: This shirt has ruffles and stripes! This high/low maxi would be perfect by the pool! My picks: Some styles of this one-piece are $15!! This tie-back tank is cute and comes in 6 colors. 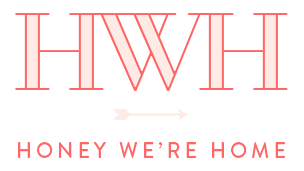 MADEWELL • $20 bralettes and $8 undies! My picks: My fave v-neck pocket tee in red stripe! This denim dress has summer written all over it! OLD NAVY • Up to 50% off all tees, jeans and pants! My picks: I love the ruffle-sleeve on this stripe tee and this little linen romper is cute too! POTTERY BARN • 25% off one regular-priced item and 30% Off Mother’s Day Gifts! My picks: I love these recycled glass vases and their live wreathes! So much great stuff in this post! Thanks! Quick question (and random) :: did you size up on the Nordy girl sweatshirt? We are about the same size and I want to make sure it has that relaxed fit since it’s a sweatshirt so debating XS vs S. Thanks! I love the Megan necklace and love that they named it after you!! So cute! I couldn’t believe it!! How cool is that?! OK, silly question…love your phone cover set….just ordered that, should I place the knob on the lower end and not in the middle? Do you that’s better for handling the phone? Great question! I just placed mine where it felt better for my hand. It’s kind of lower and off to the left side if you’re looking at the back of the phone. Ahh, that’s such a sweet gift!! Hope she loves it! Hi Megan! What size did you grab in your favorite swimsuit at Bloomingdales? It’s super cute and I remember seeing you wear it in posts last year! Would love to grab one while there is a sale. Thanks! I actually have that bed from Macy’s…light grey, it is DEF grey and looking at your wallpaper I don’t know if you’re going to like it…it is not in any way linen/beige. Gorgeous huge bed that I adore (very solid) but it is def grey…I wanted more beige/greige but a King was $400 when I got it so I just couldn’t resist. I can email pics if you’d like. I have white bedding on it so far and the walls are SW Eider White. hmmmm, I’m holding my breath til it gets here!! Sure, I’d love to see the pics! It look gorgeous online and you cannot beat the price! I’m not able to post pics in the comments…maybe I’m missing something I’m sorry! 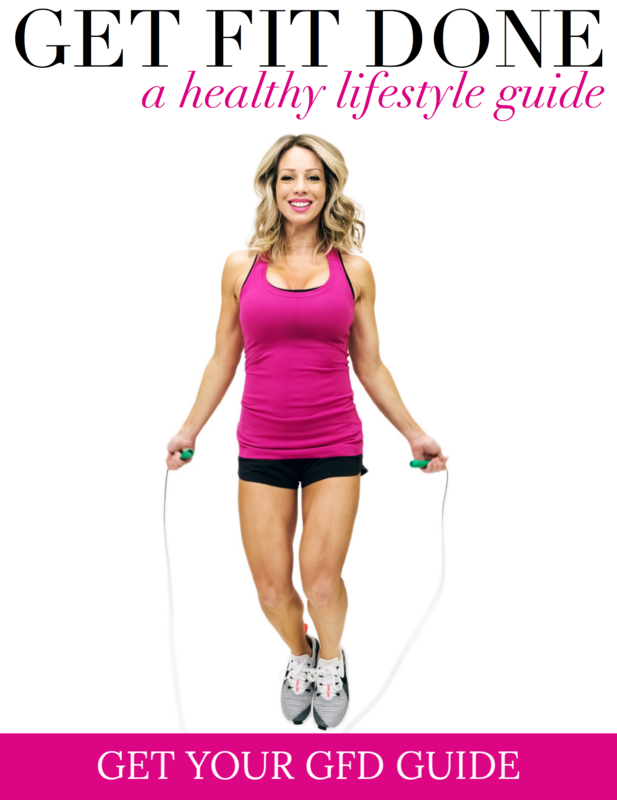 My email is jenniferschakel@hotmail.com….I couldn’t find yours on the blog (again, maybe I’m missing something!). If the color of this bed doesn’t work, check out Joss & Main. They have several upholstered neutral / linen / beige king & queen beds with tall headboards. Thanks for the recommendation, I definitely will!